Rihanna has been a creative mind to keep up in multiple areas, such as music, acting and fashion design. Nowadays, she is PUMA Women’s Creative Director, and the first move is to remix the iconic PUMA creeper. These shoes became popular by RiRi, as fans call her, and now go a little punk by adding velvet. This year, velvet is seriously one of the most used fabrics, returning to the old days when it was a premium material. Since its launch, in 2015, “The Creeper” has “suffered” multiple versions in multiple colors, materials, and textures. It also won Shoe of the Year by Footwear News. The new Velvet Creepers feature a velvet upper and platform rubber outsole with ridged tooling. The PUMA Cat logo is placed at the shoe heel. PUMA has collaborated with names such as Alexander McQueen, Sergio Rossi ou Mihara Yasuhiro. 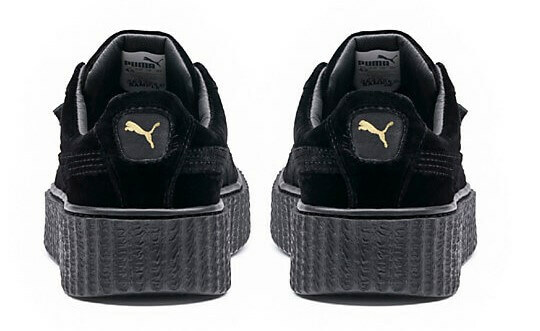 You can find the new creeper collection basically anywhere in the world, but especially in PUMA’S official site.